What Is VA Form 10-8678? 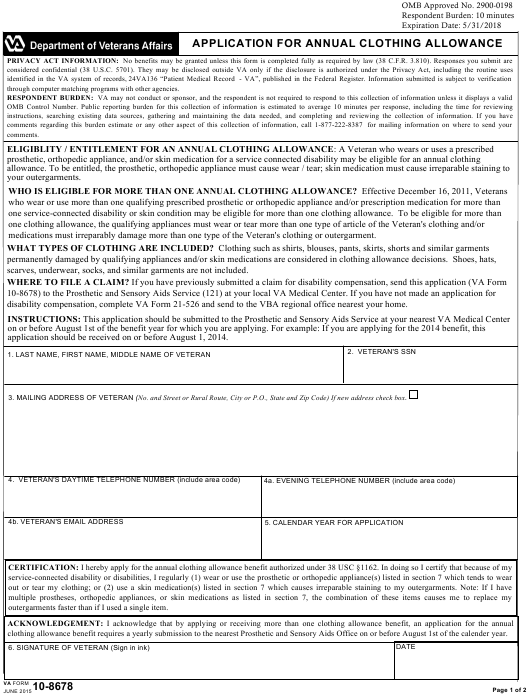 VA Form 10-8678, Application for Annual Clothing Allowance is a document used to apply for a clothing allowance. A clothing allowance is a one-time or yearly payment for veterans wearing a prescribed prosthetic or orthopedic appliance or using a prescribed skin medication that is damaging their clothes. Applying for clothing allowance is possible only after the veteran has applied for and claimed disability compensation. The latest version of the form was released by the Department of Veterans Affairs (VA) in June 2015 with all previous editions obsolete. A VA Form 10-8678 fillable version is available for download below. To be considered eligible for more than one clothing allowance, the veteran must wear or tear more than one type of article of their clothing or medications must irreparably damage more than one type of their clothing. Types of clothing and garments eligible for clothing allowance include shirts, blouses, pants, skirts, shorts and similar items, which were permanently damaged by appliances or skin medications. Shoes, hats, scarves, underwear, socks, and similar garments are not included. Items that tend damage clothing include prosthesis, rigid braces, ankle or foot orthosis (AFO) with hooks, rigid AFO, manual wheelchairs without clothing guards, specialized wheelchairs with sliding board or sliding transfer functionalities, and wheelchairs with positioning and posturing adaptations, crutches, wrist braces, prosthesis, rigid orthotics, service dogs, colostomy or ileostomy, cervical braces. Skin medication is cream, salve, ointment, lotion, or semisolid medicine that is used to treat, prevent, heal, protect and alleviate symptoms from a skin condition. The veteran can file a claim for clothing allowance if the medication causes irreparable staining, discoloration, bleeding, and damage not removable by laundering or dry cleaning. How To Fill Out Va Form 10-8678? Where To Mail Va Form 10-8678? through computer matching programs with other agencies. medications must irreparably damage more than one type of the Veteran's clothing or outergarment. scarves, underwear, socks, and similar garments are not included. disability compensation, complete VA Form 21-526 and send to the VBA regional office nearest your home. application should be received on or before August 1, 2014. 3. MAILING ADDRESS OF VETERAN (No. and Street or Rural Route, City or P.O., State and Zip Code) If new address check box. outergarments faster than if I used a single item. clothing allowance benefit requires a yearly submission to the nearest Prosthetic and Sensory Aids Office on or before August 1st of the calender year. acceptance of any payment to which you are not entitled. Item 6. Sign and date the form. Item 11 is for the impacted area. The two leftmost columns of the table and Items 12-16 are for VA use only. These Items include information about the number of clothing allowances, examination or evaluation date and the name and signature of the VA official, who authorized the form with a date. The completed VA Form 10-8678 must be signed and dated by the veteran. The completed VA Form 10-8678 should be submitted to the Prosthetic and Sensory Aids Service at the nearest VA medical center. The form may be presented in person or mailed. The location of the nearest VA medical center can be found through the VA website. The form should be filed before August 1st of the benefit year for which the veteran is applying. If a claim is submitted after August 1, the veteran would receive payment the following year. If the application is approved, the veteran will receive payments between September 1 and October 31.